No one can deny that telling a lie is part of being a kid. Say that you never told a lie yourself when you were, say, four to five years old, and you are, in all probability, telling a lie. In any case, when a child is lying at that age, there seems to be no malice attached. According to an article by Sharon Silver on her blog Proactive Parenting, kids who lie at that age are simply giving it a try to see what comes out of it. She then proceeds to tell us what do when a child is lying. Find out what else she has to say. Ms. Silver says that when a child is lying, the lying could stem from rebellious behavior, which essentially makes it a “power struggle” between that child and yourself. She points out that there is no need to get angry or punish our kids just because we’ve caught them in a lie, rebellious behavior or not. Although that sounds like she’s saying we should not do anything about it, the contrary is quite true. To deal with this kind of rebellious behavior, the writer suggests that we talk to the child about lying, but avoid using the word “lie”. Instead, we should make a remark about the incredibleness of the story, and then ask about what really happened. When you talk to the child about lying, asking the right questions will also help, as long as they help establish or re-establish any of the boundaries that you have taught him or her before. I wholeheartedly agree with her recommendations. 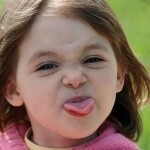 There’s no point showing anger at a four-year-old child just because of a little fib in a show of rebellious behavior. If anything, the best thing you can do is talk to the child about lying in a calm but stern manner. Make sure they see the consequences of lying. To make them admit that they lied, promise to let them off the hook. More often than not, employing this tactic when you talk to the child about lying works well at making them come clean. How do you deal with the situation if you catch your child lying? This entry was posted on Tuesday, August 6th, 2013 at 5:32 pm	and is filed under Commentary. You can follow any responses to this entry through the RSS 2.0 feed. You can skip to the end and leave a response. Pinging is currently not allowed.